Sheep’s head broth, brains in parsley sauce optional. Nostalgic foodies in happy-heirloom-beet-utopia claim that we shouldn’t eat anything that our Great-Great Grandmother wouldn’t recognise as food – yet it works both ways. Follow the soup with a fish custard and a jam pudding and you have the perfect 1950’s meal – in line with the dietary recommendations of the day – 1/6 of your diet as fat, 1/6 protein and 2/3 carbs. Yummy! This entry was posted in Food, Food and Nutrition, Foodie, Sheep, Uncategorized and tagged Brains, Broth, BSE, Food, foodie, Grandparents, Scrapie, Sheep. Bookmark the permalink. They should be consistent. 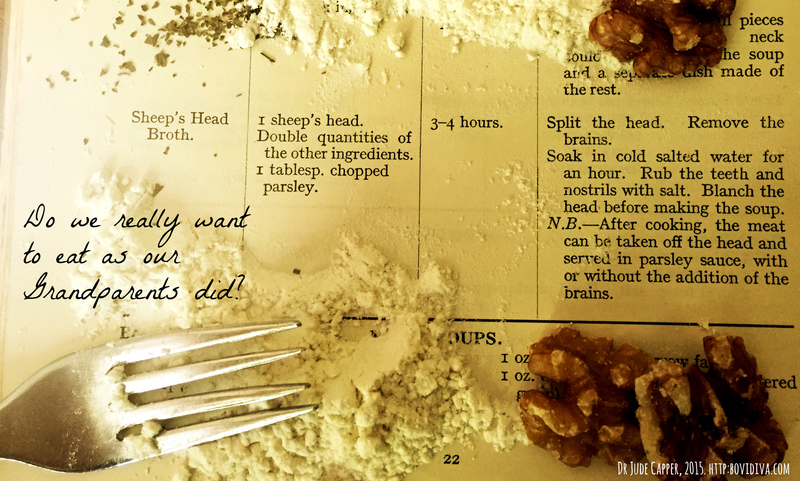 If you want to eat like your great-great-grandmother did, then fine, live like her too. Get rid of your cars, iphones, AC, insulated house, medications and get to it. If it is preferable to eat that way, then it should be even more preferable to go all in…. Some of the things our ancestors ate, WE would not recognize as food!